Lights... Camera... TEACH! : Rollerskates, A New Product, and MY FIRST EVER GIVEAWAY!! Rollerskates, A New Product, and MY FIRST EVER GIVEAWAY!! Today was a fun day as I went back to my old workplace to celebrate my mother in laws birthday. I worked as a rollerskating waitress at a 50's place right before I started teaching. Yes, you heard right.... a ROLLERSKATING waitress. They called us carhops. We danced and performed in various places with celebrities and have been on countless TV shows. I used to swing dance on skates and do lifts and flips. Yea... those were to good ol' days. Now, I'd be lucky if I could even rollerskate. LOL. Those were such fun memories! 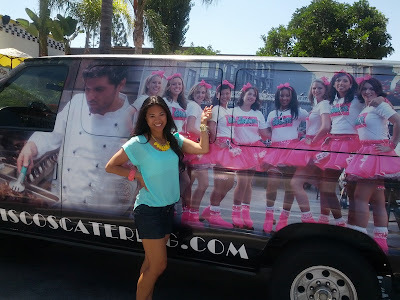 When I first pulled up, this catering car was parked out in front. OH. MY. GOSH. No words. Really. This is a really a....um..... non flattering picture of me on the catering car. I guess it wouldn't be so bad if it wasn't DRIVING ALL OVER TOWN!!!!! Sheesh! My kids however thought it was pretty cool....except my firstborn. He let me know that I looked "weird" because the windows of the car just happen to land right on me. Of course. You see. I told you. I have NO. WORDS. The inside of the restaurant is REALLY cool. We sat in a real car that was cut up. 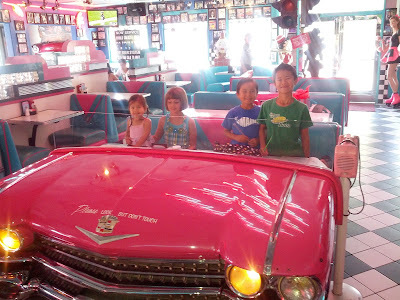 Kids loved it and loved our carhop that skated up to us to deliver our food. Not only is this a fun place to be but the food is fantastic! I worked there for MANY years and never got sick of the food. Another thing that I did this weekend is put a new little product on TPT. It's my fully editable table number labels or rather, just labels that you can use any which way you'd like. 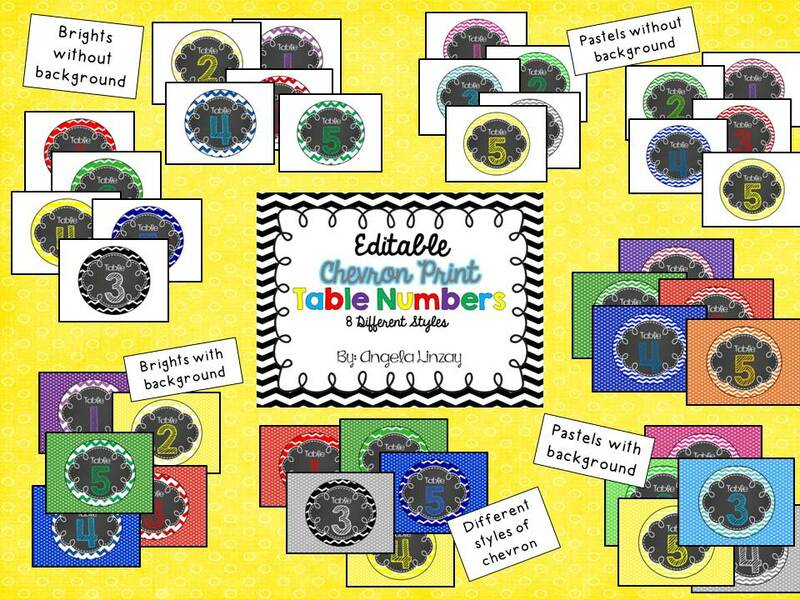 It's on TPT for only $1.50 and comes with 8 different designs. 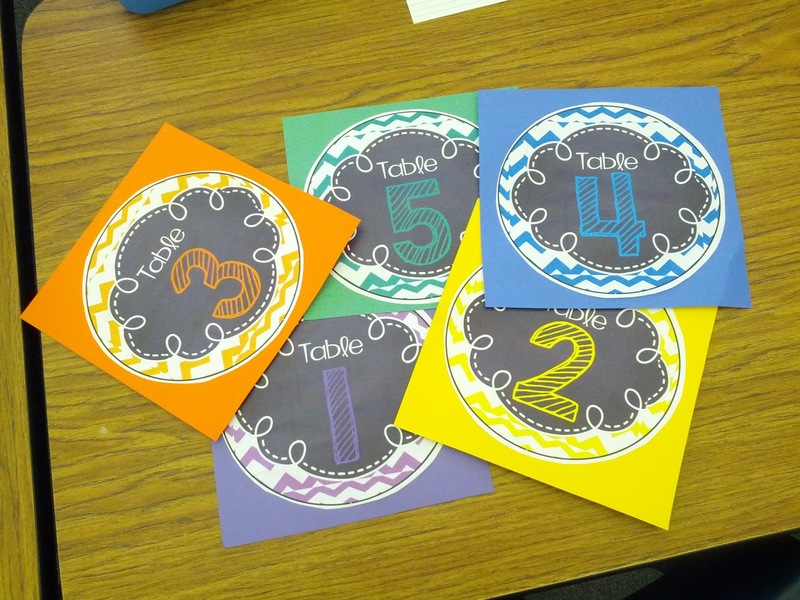 Maybe you can use them in your class to label supplies, table numbers, or whatever. 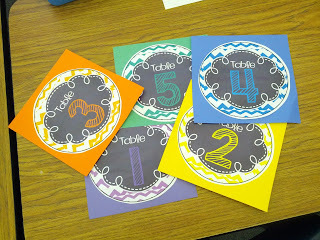 I used them in my class for table numbers. The picture here is not the best since my printer at work was all screwy and made the chevron pattern weird. I assure you that the file is perfect though. I tried it at home and it was fine. School was starting the next day so I just slapped some construction paper on these and used them for my class until I can get back to reprinting them this week. 2. Give me the BEST TPT advice that you have from organizing files, creating previews, getting your product ready to be live, to advertising and getting your product out there more, to whatever! I will take ANY and ALL advice that I can get. I not only need to be faster at creating and posting these things, but I need to get them out there for others to see. I will pick TWO WINNERS. Those who give me the BEST advice will get to pick out any one item OF THEIR CHOICE from my store! Winners will be announced on Tuesday, August 13 sometime in the evening. Please leave your advice in the comment section below. You can check out which unit you would like in my store here. Thank you friends and I look forward to learning from you all!